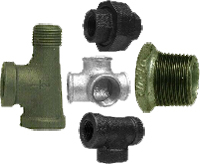 In addition to our wide selection of new and used compressors, A&W also offers associated parts and accessories, including air compressor fittings. Having been in business for decades, we are uniquely qualified to help our customers find the best “fit” for their needs, from large equipment such as the compressor itself right down to small components like fittings. Consider A&W Compressor your one-stop-shop when it comes to all your air compressor system needs, and enjoy the benefits of our expertise and our helpful, friendly technicians. We have three convenient locations in Tennessee so we can better serve our customers throughout the region. Whether you’re closest to our Maynardville, Madison, or Johnson City shop, come on over to experience the best customer service and lowest prices on air compressor fittings, from quick-connect to brass barb models, and many other parts and accessories, from regulators to hoses, tubes, piping,and more. We have options for nearly any need, from auto repair shops to industrial warehousing and manufacturing plants. For more information on any of the new and spare parts or services we offer, call or e-mail A&W Compressor & Mechanical Service, Inc. today.